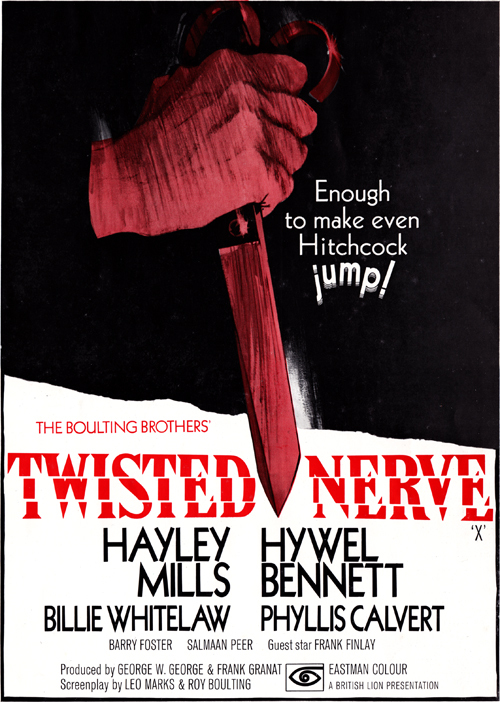 Below is the cover of the campaign book for the 1968 British 'Horror' film Twisted Nerve. It's not a wholly interesting film, per say, quite dated and occasionally politically incorrect. It's not particularly scary either, but it does star Hayley Mills (1946-), and has a remarkable soundtrack by the legendary Bernard Herrmann (1911 – 1975) - the whistling tune used also in Tarrantino's Kill Bill (2003-4). I do like the artwork, though, the stuff of nightmares, quite sinister and genuinely disturbing. 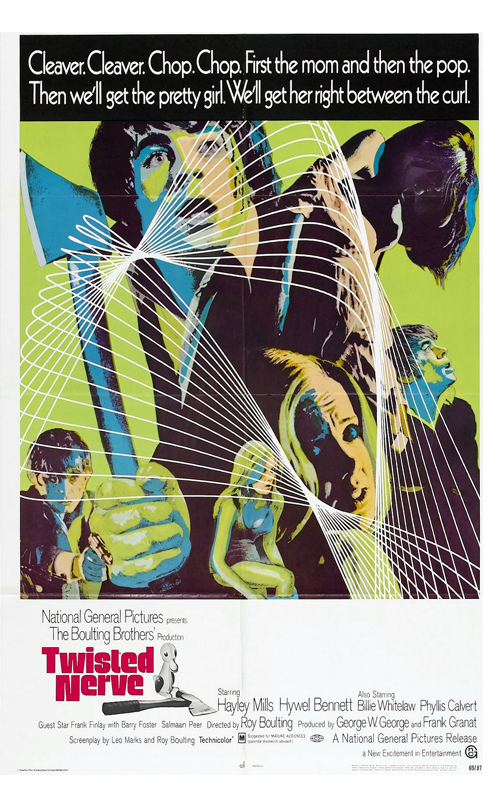 Especially the lime green, dark purples & cyan blues of the film poster. Of note, film was co-written by Leo Marks (1920 – 2001), the writer of Pepping Tom (1960), and the voice of the devil in The Last Temptation of Christ (1988). He was also, bizarrely, a leading code breaker during the second world war. As well as profiles, the booklet also adds that an insurance policy for the sum of £25,000 has been arranged for 'any person who dies of shock as a direct result of seeing the film'. I wonder if anyone took them up on that offer? Twisted Nerve, is/was also the name of a Manchester independent record label. And a place that I worked from 1999-2005. The film poster (below), very large, loomed over us from the office wall. The campaign book was a gift from Andy Votel, who ran the label, and named it after the film's soundtrack (prior to actually seeing the film). More about Twisted Nerve & Andy Votel another time.